Live bacteria improves the development of the biological filter and helps clean a dirty aquarium. 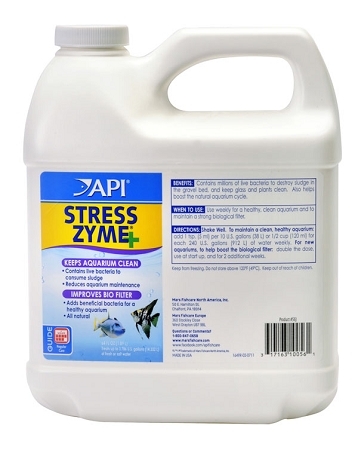 Stresszyme contains over 300 million live bacteria per teaspoonful. Breaks down organic compounds that cause dangerous conditions such as ammonia and nitrite poisoning and low oxygen levels. Continuous use assures an active biological filter, cleaner aquarium, healthier fish and good water quality. No refrigeration necessary. Use when setting up and maintaining an aquarium. For use in fresh and saltwater.